Short rows are an incredibly useful technique in knitting. They’re used to create curves, change stripes, turn corners and add bust shaping. Although simple in principle, they add a fair degree of complication to pattern instructions, and can be a particular challenge when building them into charted patterns. 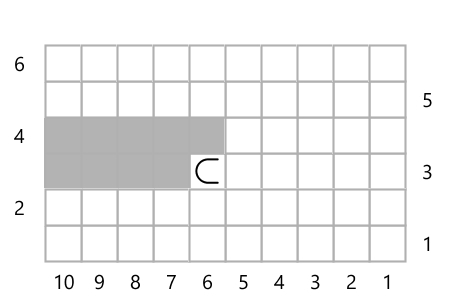 Stichmastery makes the key element of dealing with short rows in charts entirely straightforward: there are tidy symbols available! There’s a left-turn and a right-turn symbol. Their standard definitions are deliberately generic – short row right and short row left – because there are several different techniques for the turn and what happens around it. There’s the classic “wrap and turn”, where a collar of yarn is placed around a stitch. 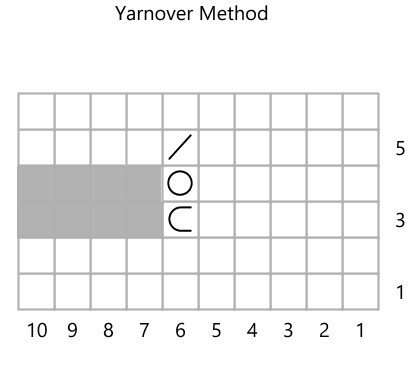 The yarnover and shadow methods have you work an increase at the turn point; the German method has you create a doubled stitch. The Japanese method (and the associated variations), have you use a safety pin or removable stitch marker to mark the yarn at the turn point. 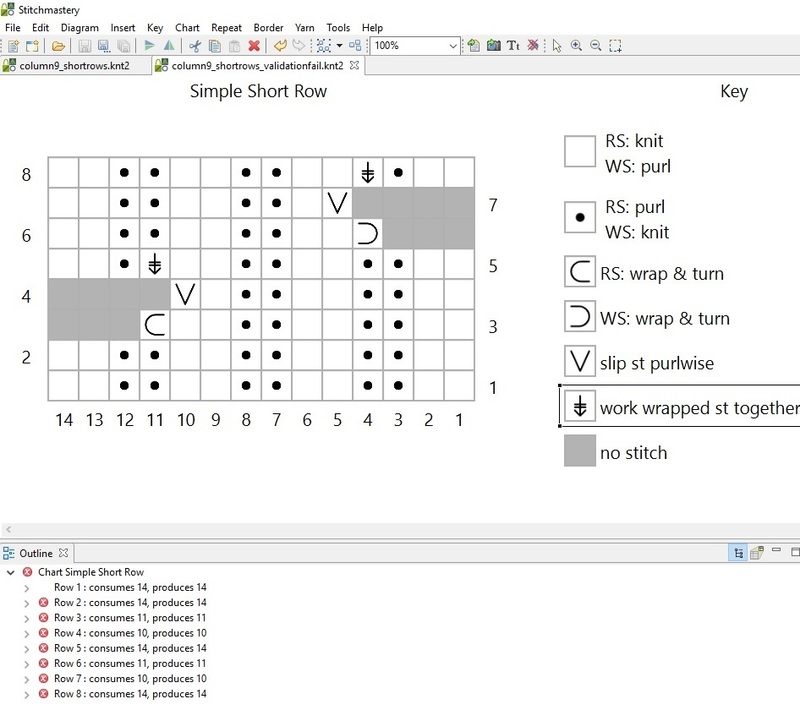 If you’re using the classic wrap and turn method, then the short-row symbol represents the wrap very nicely. In this chart, the last stitch worked is number 5, and stitch number 6 is wrapped. The stitches after the turn symbol are marked as ‘no stitch’ to indicate that they aren’t worked; and in the row after the turn, there is an additional ‘no stitch’ symbol above the turn symbol since that stitch wasn’t worked, only wrapped and slipped. It’s important to note the position of the short row turn symbol. It should be positioned AFTER the last stitch worked – put another way, the turn symbol is always placed where the gap is. The reason for this is simple: if you’re working in a pattern stitch, you need to show what do with the last stitch worked. If you had placed the turn symbol on the last stitch worked, you’d lose the information that the final worked stitch of row 3 needs to be purled. In this chart, I’ve also introduced another character. In the version 3 of Stitchmastery, there’s a new symbol in the Miscellaneous category, Pick Up Strands. I’ve used that, and would rename it in the key to “Work wrapped stitches together with wrap”. For both of these methods, you’re acting on stitch 6. In the German version, you’re first slipping it then lifting it up and over to create a doubled stitch. In the Shadow method, you work a lifted increase to double up the stitch. For either, the first time you work over the doubled stitch, you work both legs/strands together. 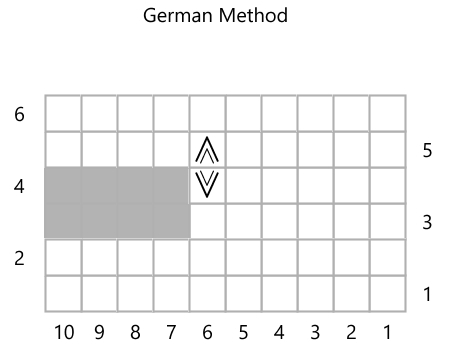 For the German version, I’ve created a custom symbol here in version 3, but the choice of the symbol is up to you. For the work both legs, I’ve just turned the symbol upside down. In this case, the turn symbol is moved one stitch to the left, since you do actually work stitch 6 in row 3, before turning and creating the doubled stitch. The decision is driven by whether you think the knitter would be helped by having a reminder about the significance of the ‘no stitch’ symbols here. For the shadow method, I’ve used a double-loop sort of symbol, the ‘create the doubled stitch’ one way up; the ‘work the two strands of the doubled stitch’ symbol is the same thing, just upside down. 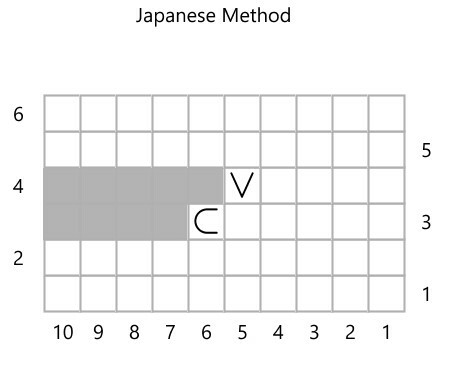 To represent the Yarnover method in a chart, I’ve placed the yarnover symbol over the turn symbol. In this case, the yarnover is a new stitch, worked in the gap created by the turn. Although, technically speaking, this actually adds a new proto-stitch after existing stitch 5, we don’t need to adjust the width/stitch count of the chart, since that extra stitch-like-thing is immediately decreased away the moment you work over it. In this way, it’s like bobbles and nupps and Estonian gathered stitches. They’re increased on one row, and immediately decreased on the next, so there’s no real need to modify the chart size. In row 7, the k2tog is placed in column 6, as it is worked over stitch 6 and the yarnover that sits to its right. There’s no ‘no stitch’ symbol, since the stitch count stays constant at 10. And again, the turn symbol could be considered optional. If you didn’t include it, stitch 6 in row 3 should be marked as a ‘no stitch’. And again, it’s your choice whether to include the turn symbol, although in this case I’d probably leave it in and adjust the description in the key with instructions for the pinning required. And definitely make sure that the names of the symbols are helpful and correct. If you’re using it, change the name of the short row symbol, so it aligns with whatever method you’re using: “wrap and turn”, “turn”, “turn and pin”, etc. And if you create a special symbol for the other piece – create a double stitch, make sure that’s labelled properly, too. No matter what method used, and whatever you’re doing with the symbols, there is one thing to be aware of. In the current version of Stitchmastery, there’s a hiccup if you’re using the Outline feature to validate the stitch counts. Because of the different methods of working short rows, the system isn’t currently able to count the stitches accurately. Specifically, if you use the ‘no stitch’ symbol in a chart with short rows, the validation will fail. The solution is simple, however: instead of the actual grey ‘no stitch’ symbol, just use the grey from the Colours menu. Problem solved! Validation goes ahead! 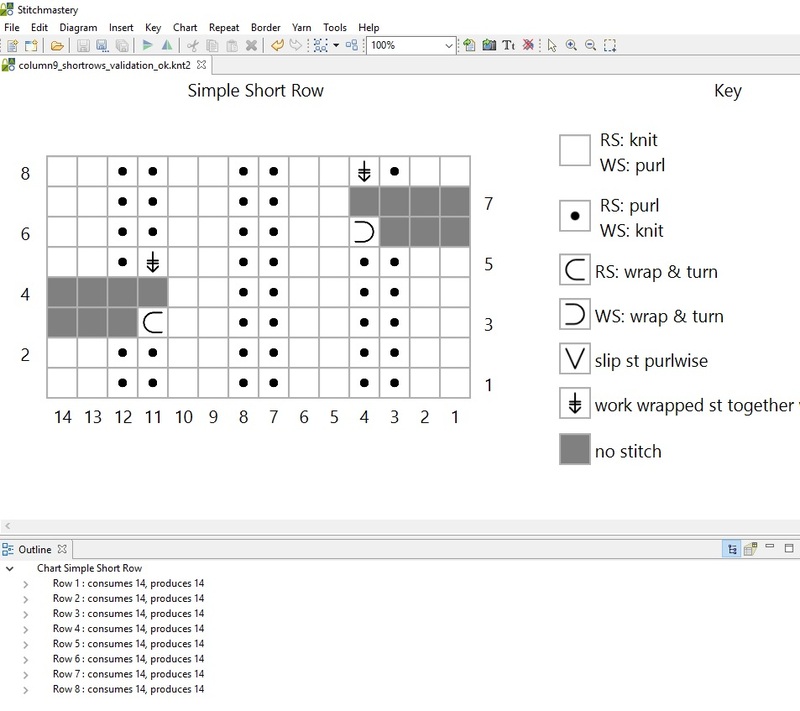 Just make sure you do a visual check of the rows that do have short rows, to make sure that your ‘no stitch’ symbols (and any other supporting symbols) are placed appropriately. And know that Cathy and the team are definitely looking at ways of dealing with the validation for future versions – stay tuned. Stitchmastery Mac OSX Users – please read!